DVD players have wiped traditional VHS players of the face of the planet. The discs have replaced tapes in stores and the players are available now at an almost disposable price. A quick Internet search throws up a range of DVD players for sale at less than £40. There’s a lot of choice out there for the potential purchaser and the range of options on the modern DVD player can be baffling. Remember though that no matter which DVD player you buy it will play all DVD video disks without a problem. When choosing a DVD player one of the most overlooked options is the design. Though specifications and build quality are very important as well there’s not much point getting one that you don’t like the look of. Most of them are roughly the same size but you can get ultra small ones or even players with built-in screens for portable viewing. You can’t judge the DVD player all on looks though and there are some important specifications to look out for that will improve your enjoyment of DVDs. The more connectivity options the DVD player has the more useful it will be. 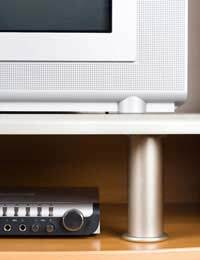 If you can connect it to more types of television then it will remain useful even if you upgrade your TV. Many DVD players also double as surround sound systems that can offer much improved sound quality and make watching those blockbuster films even better. Not only that but you can also get DVD recorders that allow you to make high-quality recordings of your favourite television programmes. The disks can be re-used just like VHS tape but offer much better reliability and will not degrade over time. Though it’s worth pointing out that they’re not indestructible and like many technologies will become obsolete in time. Connecting a DVD player couldn’t be simpler. Modern equipment is much easier to hook up than in the early days of technology. At the very least a DVD player will have a SCART socket. This is the standard analogue connection and all but the oldest televisions will have a SCART connector. All you have to do is plug the cable in and you’re ready to go. With DVD offering better quality video it makes sense to invest in a better quality SCART cable. Most DVD players are supplied with a cable but these are often cheap and cheerful version that do the job but don’t give the highest quality. With a more expensive cable both image and audio quality will be much improved. If your TV has composite inputs this offers even better quality video. Composite video connectors can be identified by a row of three sockets that are red, green and blue. These can send an even higher quality signal to your TV though they don’t carry sound so you’ll need to make provision for audio should you use this connection. Two new technologies that are gradually replacing DVD are Blue-Ray and HD-DVD it’s yet to be seen which one will prove the most popular but they will eventually replace DVD video. As it stands though DVDs are still the most popular and high quality way to watch movies. Which TVs Will Work on Digital Tv? How Can I Get Digital Television?